Rubber Room Ramblings: TRIANGLE CARD CLOSURE PATTERN VIDEO! 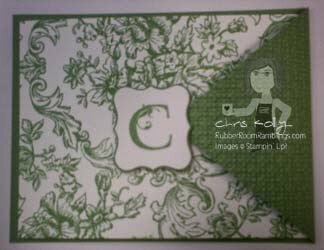 Linda Garrett, one of my Stampin' Up! Demonstrator friends, shared this great card pattern with us at our last get together. I knew immediately it would become one of my favorites. She shared the monogram card, and from that I made the snowman card. 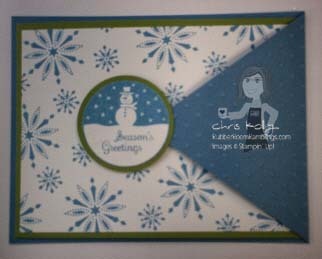 In today's video I will share with you how to make this card. Here are the measurements you will need (they are repated in the video also). The card back/wrapper (outside part with the triangle) is 8 1/2 x 4 1/4 and you score the 8 1/2 side at 5 1/2. The card base (the part that opens) is 10 1/2 x 4 and you scored the 10 1/2 side at 5 1/4. I hope you enjoy today's video and will have fun trying out this unique card fold idea.